Stay in the hot centre of everything in Dublin! 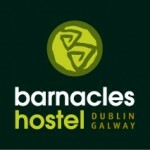 Barnacles hostel is located in the heart of Temple Bar, with pubs, restaurants and night clubs right at your doorstep! All rooms are ensuite, and come in range of sizes. Wifi, breakfast and linen is provided free of charge. Barnacles Temple Bar hostel has been voted the best hostel in ireland in 2013 and 2012 – we have great staff on hand 24/7 to make sure you enjoy your stay in Dublin! For rates/bookings and for further info, please use the contact details below.